Peda is a most loved sweet from the Indian subcontinent, usually prepared in thick, semi-soft pieces. The main ingredients are khoa, sugar and traditional flavorings that is constituted in all Indian sweets like Peda in Harris Park, Australia for special occasion like Diwali at Taj Indian sweets and Restaurants in Sydney. Peda is a most loved sweet from the Indian subcontinent, usually prepared in thick, semi-soft pieces. The main ingredients are khoa, sugar and traditional flavorings that is constituted in all Indian sweets Peda in Harris Park, Australia for special occasion like Diwali at Taj Indian sweets and Restaurants in Sydney. Mathura peda is a North Indian sweet dish that originated from Mathura in India. Here Delicious Indian sweets in Australia is prepared from mawa (khoya) Peda is very popular and the peda is also a mawa sweet variety. Mathura peda is so famous in India that the term is often used in Occasions like Diwali. Taj Indian Sweets and Restaurant in Harris Park bring you the delicious Mathura Peda. 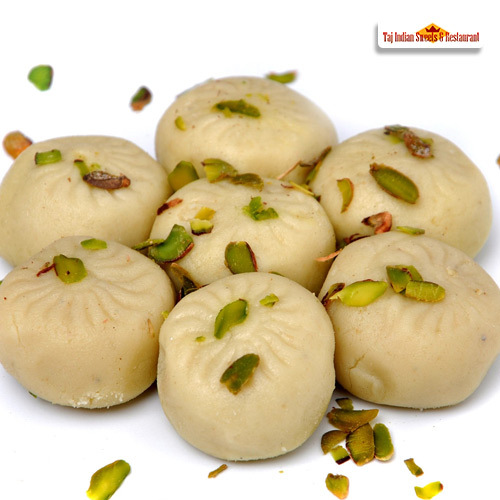 This peda is a favourite in North India and originated in Mathura, the land of Lord Krishna. No peda can beat the taste of this one and you simply must have it in your home. 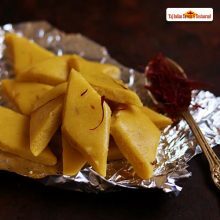 The mouth watering sweet to go with the Indian festivities. We employee individuals that are committed towards their respective roles and put in a lot of effort to bake the most exotic and tempting Indian sweets in Australia. Subsidizing on the ability of our skilled personnel, we are keenly influential in delivering a comprehensive array of Best Peda in Australia. Jaipuri burfi is a dense milk based Delicious Indian sweet from the Indian subcontinent, a type of a desert that is also exchanged at Diwali season. Shower your love to your loved ones with these Jaipuri Barfi in Harris park, Australia at Taj Indian Sweets and Restaurant in Australia that is approved as one of the most reliable Manufacturers of Best Indian sweets in Sydney, Australia. Taj sweets and Restaurants in Sydney, Australia is one of the largest sweets and snacks manufacturers that deliver the best stuffs to the consumers. 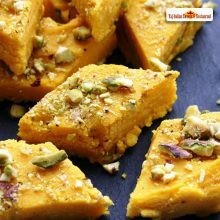 We offer delectable snacks including Mango Burfi in Harris Park that is made up of few ingredients which are mango puree, sugar, milk powder and paneer. We always try to provide Delicious Indian sweet in Australia and Quality in the Best of Packaging. Our motive is to Rediscover and Recreate the trend of Healthy Eating and Innovate latest new methods to Nourish and Delight everyone we serve. 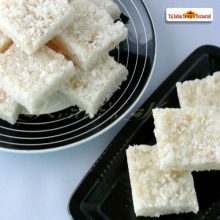 Coconut Barfi which is a North Indian dessert recipe combines a delicious fusion of crunchy coconut and aromatic essence of cardamom to relish on your favorite and suspicious occasions and festival like ‘Diwali’ which is around the corner, enjoy the most delicious sweets in Sydney, Australia at your own Taj Indian sweets and restaurant. Kesar katli is a popular Indian sweet in Australia liked by the kids and adult alike. 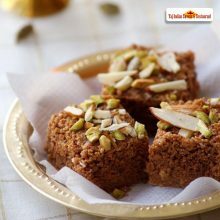 This delectable dessert recipe is prepared on several occasions and festivals like Diwali which is about to come. Relish and celebrate this special season of sweets with our Kesar katli in Harris park, Australia at Taj Indian sweets and Restaurants in Sydney.